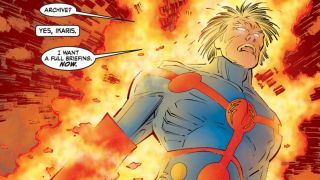 The Eternals is reportedly the next MCU movie heading our way post-Avengers 4 – but what is it? Avengers: Endgame is going to end the MCU as we know it – but what comes next? The Eternals, that’s what. The next MCU movie for us to get obsessed over has been making some important moves recently, not only adding writers and a director, but also giving us a glimpse at the direction Marvel might just go in Phase 4. Who’s ready to head to space? The Eternals could fill that Guardians of the Galaxy 3-shaped hole in our life but, first, the essentials: The Hollywood Reporter has revealed that Chloe Zhao is onboard to direct, with Matthew and Ryan Firpo – who are highly-touted in their own right – joining as writers. With the trio’s average age just pushing 30, it’s great to see some new, fresh talent join the MCU fold. It’s a good thing, too, as The Eternals is going to be out there (quite literally), unlike anything we’ve seen before. At their core, The Eternals are a group of immortal beings who deal with all things cosmic and often come into conflict with their evil counterparts, The Deviants. As you can tell from their name, they’ve been around a long time: millions of years to be exact, and their adventures have taken them from Ancient Greece to the deepest reaches of space and time. It sounds as if, though, the movie will draw partially from Neil Gaiman’s run on the comic book, as THR reports it will centre on a love story between Ikaris and Sersi, who wants to live among humans. As of yet, however, no The Eternals release date has been confirmed. Captain Marvel is next up, before Avengers 4 has us saying goodbye to Phase 3. Spider-Man: Far From Home kicks off Phase 4 in July 2019, then there’s a trio of unannounced movies for each of 2020, 2021, and 2022. If moves are being made now, expect an early 2021 release date at the latest, so circle May 1, 2020, July 31, 2020, November 6, 2020, and May 7, 2021 in your (extra-long) diaries. Expect colour, chaos and, honestly, a little bit of confusion. The Eternals aren’t mainstream names, nor do they really fit in with the (relatively) grounded nature of the MCU. They’re god-like beings who can’t be hurt; a far cry from the likes of Peter Parker going on a field trip in Spider-Man: Far From Home. Still, Marvel hasn’t done much wrong so far – and The Eternals shows the studio has no signs of slowing down post-Avengers 4. Don't forget to check out all of the new Marvel movies from Phase 4 (and beyond) - and try to guess where The Eternals fits in. Image: Eternals #4 (2006), John Romita Jr.